A coastline longer than the equator and the sea brimming with record-sized cod, salmon, and halibut – chances are you will get hooked on sea fishing in Norway. Norwegians are sometimes said to have seawater in their veins. As a nation, Norway has always lived off the sea. The whole coastline, from Southern Norway through Fjord Norway on the west coast and all along the coast up to Kirkenes in Northern Norway, is dotted with villages where fishing is still an important part of the local lifestyle. For the most genuine holiday experience, many visitors stay in one of the cosy rorbuer (traditional fishermen’s cabins) that are available for rent along the coast. Contrary to what you may think, sea fishing can be enjoyed all year. The summer months are the prime season, when both locals and visitors make the most of the warm temperatures and light evenings. Go above the Arctic Circle to get the ultimate outdoors adventure under the midnight sun. On the other hand, fishing in winter, spring and autumn has the advantage of less crowds and better prices for accommodation and services. 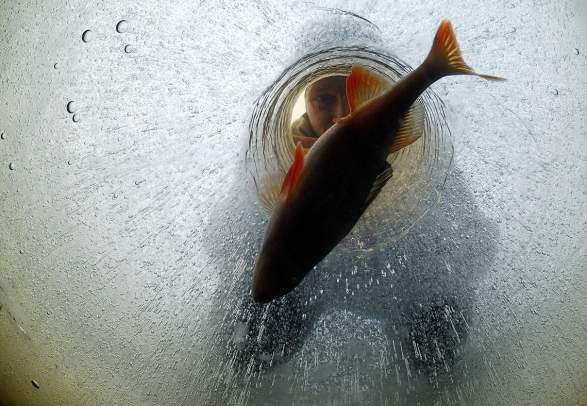 The winter months offer fishing opportunities of a different kind. The cold, dark climate is compensated by frequent sightings of the northern lights, and, most importantly, by outstanding opportunities for cod fishing. Between January and March, huge amounts of skrei (migrating cod) appear along the coast to spawn. This may be your best chance to get a record-breaking cod on the hook. The World Championship in cod fishing, which takes place in Lofoten every year in March, attracts both advanced, ambitious anglers and amateurs who come to soak up the merry atmosphere. And by the way, even if cod is the most common species in these waters, it’s far from the only one. At the end of the day we bet you will post proud selfies of your freshly caught sea trout, or halibut, or salmon, or perhaps a haddock, plaice, mackerel, monkfish, ling, tusk … we could go on, but you get the point. Enough said – we hope that you’ll find all the details you need for your next sea fishing adventure below. Follow the rules of the sea, and make sure you know what they are. Think safety at all times. Respect the sea and the weather. Wear life jackets or other flotation devices. Make sure you are rested and sober. Be considerate, and remember that safety, the environment, and the well-being of everybody is a common responsibility. If you dream of giant fish, choose your holiday location wisely. In Northern Norway, record catches of cod and other species are the rule rather than the exception. The number one summer destination for Norwegians is gradually being discovered by foreign tourists. 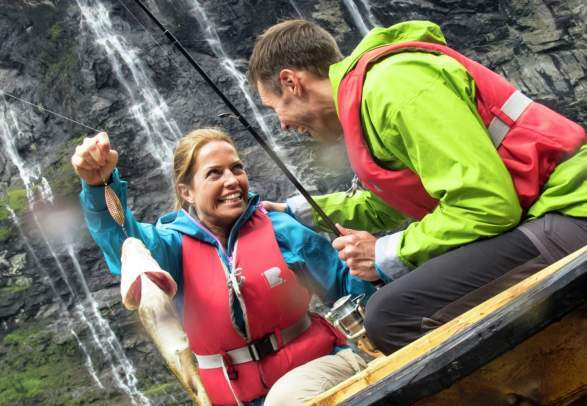 Do it like the locals and try fishing in the area known as the Norwegian Riviera. What’s so special about Norway’s coastline? Norway is blessed with an exceptionally long coastline where a huge number of species thrive and grow large. The secret is found in the warm currents of the Gulf Stream, which lead to a high production of plankton, which in turn attracts huge shoals of hungry sea creatures. In combination with rigorously enforced fishing regulations, populations of many species are in fact on the increase. In these times, when fighting pollution is a major global issue, Norway stands out with its clean sea waters. If you want to get that dream catch, you’d better rest well and rise early. The many accommodation options along the Norwegian coast include hotels, campsites, and the traditional fishermen’s cabins rorbuer. Flick through our selection of offers below. Marica smashed the 46 year old record on a fishing trip to Finnmark. Around the world, millions of people are regularly enjoying seafood originating from the Norwegian coast. But nothing beats the taste and texture of a fish that has just been caught from the cold and clear waters. Trøndelag is famous for its good fishing, and the same applies to the quality of the fish hauled from the ocean. Explore the local food in Trøndelag! There is no need to wait until you’re here to start planning your trip. Filter your search and check out the offers below.